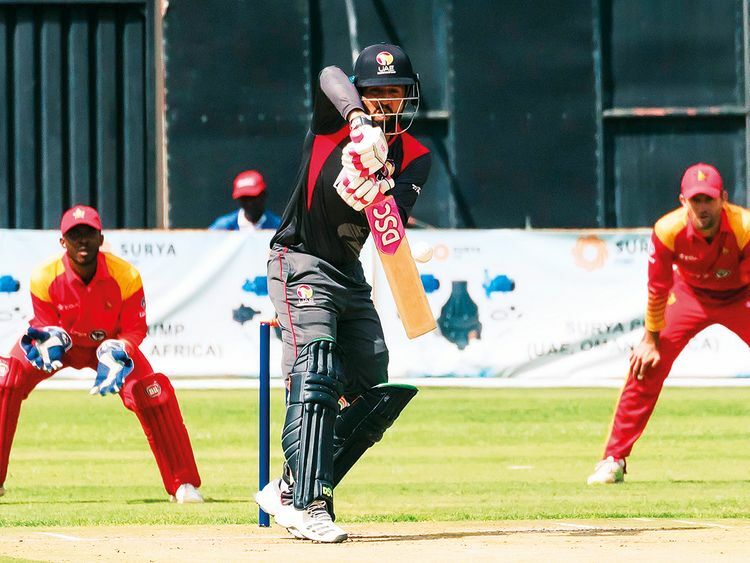 Dubai: Zimbabwe scored an emphatic seven-wicket win over UAE in the first match of the four-match One Day International series at the Harare Sports Club ground. The UAE were bowled out for a paltry 110 in 44.5 overs. Except for Mohammad Boota, who hit 36, none of the other batsmen withstood the Zimbabwe attack. Chasing the small target, Zimbabwe won at a canter in 23.1 overs. Though Zimbabwe lost opener Solomon Mire, trapped leg-before by Qadeer Ahmad for 11, wicketkeeper Regis Chakabva (38) and Craig Ervine (51) ensured an easy victory. It was a special day for wicketkeeper Chakabva, who also took five catches. Zimbabwe won the toss and elected to bowl. UAE opener Ashfaq Ahmad was the first to go, trapped leg-before by Kyle Jarvis for two in the third over. In the sixth over, Ghulam Shabber edged Tendai Chatara to Chakabva for two. Chatara struck again in the 10th over to remove Chirag Suri for eight. Suri also edged Chatara’s away going delivery to wicketkeeper. Three down for 19, Shaiman Anwar and Rohan Mustafa tried hard to lift the team out of trouble. They took the score to 38 when Anwar on 11 edged Donald Tiripano to give Chakabva his third catch. Two runs later, opener Rohan too fell trying to hit off-spinner Sikandar Raza and missed the delivery and got clean bowled for 10. More disaster was to follow as next man Mohammad Usman got caught at mid-off by Peter Moor off Tiripano for one. Imran Haider and Boota held on and added 29 for the seventh wicket before Haider on 10, trying to steer the delivery past slip, edged Brandon Mavuta to Chakabva. Skipper Mohammad Naveed fell with the score at 80, giving Chakabva his fifth catch by edging Chatara. Boota went on to top score with 36 off 76 balls with two boundaries and a six. Zimbabwe bt UAE by 7 wkts. UAE 110 in 44.5 overs (Mohammad Boota 36, Kyle Jarvis 2 for 11, Tendai Chatara 3 for 25, Donald Tripano 2 for 18, Brandon Mavuta 2 for 30) Zimbabwe 111 for 3 in 23.1 overs (Regis Chakabva 38, Craig Ervine 51). Man of the match: Tendai Chatara.